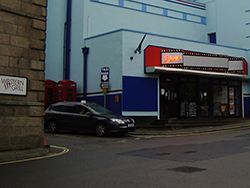 The main taxi rank in St Ives is located just of Royal Square and next to The Royal Cinema. Taxis a generally available throughout the day and evening. You may have to wait for a while during busy periods - particularly during the main hoilday season. St Ives Railway Station also has a taxi rank - but there rarely seem to be any taxis there. If you are travelling by rail it is best to book a taxi in advance. The town no longer has a car hire service. There are a number of car hire companies at Penzance Railway Station.